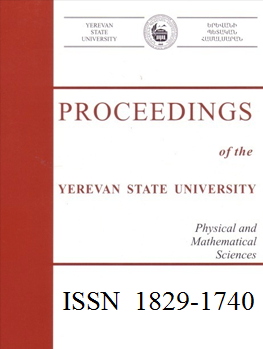 Journal “Proceedings of Yerevan State University, Physical and Mathematical Sciences” is successor of the Journals EPH Gitakan Teghekagir (YSU Scientific Reports) published since 1925 (first Editor in Chief Stepan Ghambaryan) and EPH Gitakan Teghekagir Bnakan Gitutyunner (Proceedings of the YSU, Natural Sciences) published since 1967 (first Editor in Chief Hovhannes H. Chaltikyan). Since 2009 the journal is splitted into three series (Physical & Mathematical Sciences, Chemical & Biological Sciences and Geological & Geographical Sciences) publishing three times a year each. Currently in “Proceedings of the YSU, Physical and Mathematical Sciences” peer-reviewed works on mathematics, informatics, mechanics and physics are published. The articles are received and published in English. The journal presents original articles containing new results of theoretical, experimental and applied researches, carried out in YSU or other Armenian and foreign scientific centers. Since 2011 Editor in Chief is Professor Varujan S. Atabekyan, Deputy Editor is Armenian National Academy of Sciences Corresponding Member, Professor Albert A. Kirakosyan. The Journal is the member of Zentralblatt MATH (zbMATH) abstracting and reviewing service in pure and applied mathematics, produced by the Berlin office of FIZ Karlsruhe – Leibniz Institute for Information Infrastructure GmbH (FIZ Karlsruhe). Editors are the European Mathematical Society (EMS), FIZ Karlsruhe, and the Heidelberg Academy of Sciences and Humanities. zbMATH is distributed by Springer. All the papers published in the journal are also represented in RF Academy of Science Mathematical Institute informational system MathNet.Ru and GOOGLE Scholar.